Radical linguist, philosopher, and activist Noam Chomsky is one of the world’s foremost intellectuals. Known for his brilliant evisceration of American foreign policy, state capitalism, and the mainstream media, he remains a formidable and unapologetic critic of established authority. 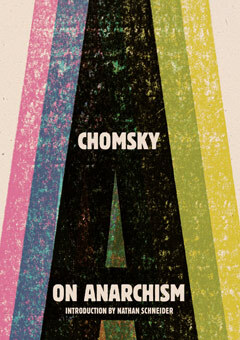 On Anarchism sheds a much-needed needed light on the foundations of Chomsky’s thought, specifically his constant questioning of the legitimacy of entrenched power. The book gathers his essays and interviews to provide a short, accessible introduction to his distinctively optimistic brand of anarchism. Chomsky eloquently refutes the notion of anarchism as a fixed idea, suggesting that it is part of a living, evolving tradition, and he disputes the traditional fault lines between anarchism and socialism, emphasizing the power of collective, rather than individualist, action.